One of the great ironies of the fast food world occurred last week, when KFC ran out of chicken in the United Kingdom. The dearth of fried gristle occurred after the poultry conglomerate switched suppliers as a means of saving money in one of its biggest markets. 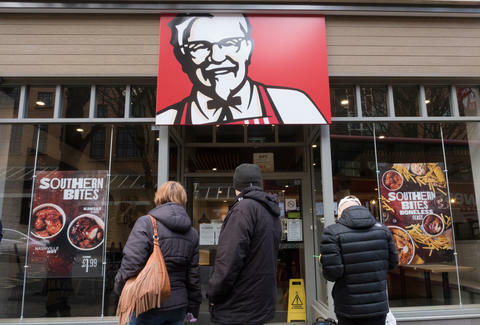 But what seemed like a brief nightmare for KFC has proven to be a prolonged ordeal, because the chain is reportedly now experiencing a significant gravy shortage. That's right: KFC deprived its customers in the United Kingdom of chicken for a few days. But now that chicken has returned, there's a dearth of gravy. A spokesperson for KFC's parent company Yum Brands told CNBC the company is now contending with "gravy supply disruptions," per the report. KFC switched its supplier from Bidvest Logistics to DHL earlier this month, and attributes DHL's current service to "teething" issues. During the height of its travails, KFC had to close 700 of its 900 outposts in the UK. Now, 97% of its outposts are open again, nearly restoring faith in the world's foremost purveyor of chicken to do what it does best. "Due to the ongoing distribution challenges DHL is experiencing, some restaurants are continuing to serve a reduced menu," the spokesman told CNBC. "We're working as hard as we can to get this sorted out. We know that our gravy is a big favorite!" KFC has been making up for its lack of flagship menu items with some self-effacing social media marketing. Earlier this week, the company issued an apology, complete with a photo of a KFC bucket's letters rearranged to reflect the chicken drought's prevailing mood. The company issued another, decidedly less profane apology. The good citizens of the UK and Ireland have surely had to deal with greater dilemmas than a fast food gravy shortage. But in the interim, while KFC recovers, it's good to know there's always a bit of cheeky Nando's when all else fails.